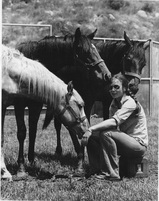 _Tina Steward has loved horses for as long as she can remember. She started serious equitation and dressage when she was 13 with Claus Albin. At 18 she was given the opportunity to work with and ride for George Morris for two years when he taught clinics in southern California. Mr. Morris felt that she was one of the most talented and gifted young riders he had taught in 20 years. Tina was asked to come to Hunterdon to train with Mr. Morris. She declined because she felt a career in Veterinary Medicine was a better direction to take. While getting a Bachelor’s in Zoology, a Master’s in Nutrition (enzyme kinetics) and completing her DVM as a Regents Scholar at UC Davis, she rode primarily with Herman Koopman for 10 years. Alois Podjhasky felt Herman Koopman was the only one in the U.S. that really understood the correct and classical development of the horse. 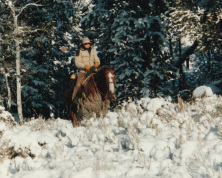 While developing her equine lameness and chiropractic practice in the Bay Area she rode extensively with Major Anders Lindgren for 11 years. She also rode with Charles De Kunffy for 12 years. 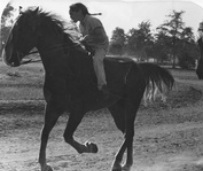 During this time she rode in clinics with Gwen Stockebrand, Alfred Knopfhart, Jules Nissen, Jan Ebling and John Lasseter. _Tina has trained several horses to finished competitive Grand Prix and 100’s of others in Piaffe, Passage , Pirouette, and Tempi changes. In 2011, Tina had five students receive their USDF Silver Medals, one received her USDF Gold Medal and one placed 2nd in the Brentina Cup missing 1st by less than 0.3 %. Tina brings a unique understanding of muscle development and biomechanics to a classical approach to dressage training. She feels that dressage should first of all be therapeutic and restorative to the horse (mentally and physically) and finally it should enhance the gaits and make the horse more beautiful. Her gift is gait enhancement for the horse and humor and empathy for both the horse and rider. She has worked with a huge variety of horses and each individual gets personalized attention with the goal of improving lightness, quality of gait and progression toward the FEI level. Tina believes that all horses and riders should train toward a goal of FEI work so that no shortcuts or compromises are made. She firmly believes that any horse can school at the Grand Prix level given time and correct gymnastic training. The path is the goal and the horse is the clock!